Conflicts among different departments within a company are attributed to the increasing strains brought about by resource and workflow interdependence between them. Expected as it is, the tension among them can be effectively managed and its effects on operations mitigated. Conflict is inevitable among us humans. When social entities have difference in attitudes, values, beliefs and skills, they are naturally bound to contradict each other fuelled by their individual quest for recognition and, ultimately, supremacy. Conflict is normal in workplaces, because these are comprised by humans. Office discussions can be helpful in weeding out procedures and processes, and in determining the necessary changes to streamline operations. However, unresolved conflicts can result in feelings of dissatisfaction and depression among office workers, which may lead in resignation, dissolution of personal relations, aggression and, worst, violence. They can have a negative impact on employee and company productivity, and poses a threat to the camaraderie absolutely necessary for a fruitful company operation. Corporate conflicts may arise from myriad contexts and occasions. With the advent of the knowledge economy, conventional organizational relationships have been blurred in light of different innovations in the business environment. Offices are increasingly adopting organic and flexible team-based structures, which makes departments interdependent. The heightened levels of interaction among employees from different departments with varied specializations lead to more dynamic but increasingly complex organizational relationships. Thus, the collaboration between different teams within an organization has evolved to be a key factor as well as a crucial challenge to surviving the rising market competition and satisfying customer expectations. The HBO original series Game of Thrones has grown to a pop culture phenomenon straight out of the pages of the incredible novels by George R R Martin. It lured viewers into the land of Westeros where swordplay, dragons and magic come to life. Game of Thrones may be a product of pure imagination, but curiously its popularity rides high on the fact that it features remarkably engaging human interactions. The Seven Kingdoms may be fictitious, but they are not so unfamiliar after all, particularly when one peers past the weirwoods and into the affairs of the Great Houses. 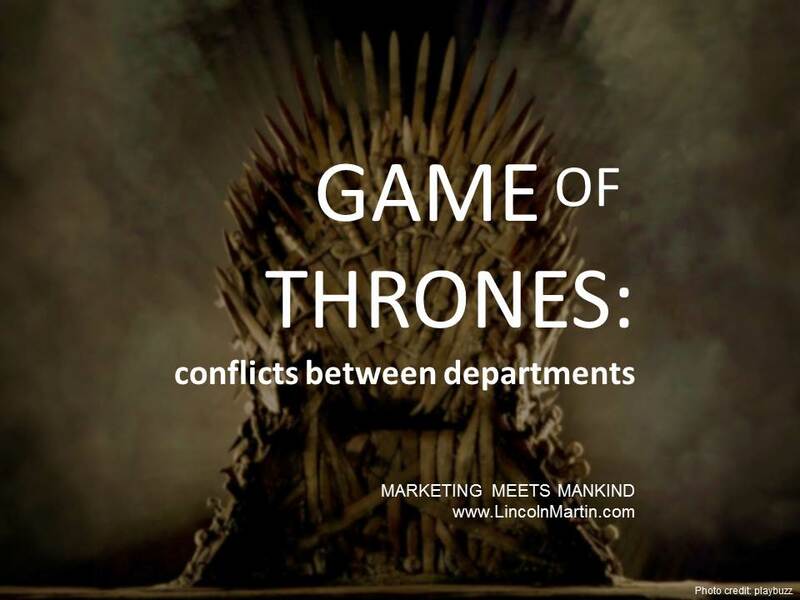 In fact, one will realize that ruling the different factions is not all too different from running a business: A company has many departments, all with unique tasks, skills and objectives, much like Westeros. Like a ruler running the Kingdoms, a director or a president must see the diversity of the corporate departments as an advantage than a bane. He or she must have a keen grasp of each department’s strengths and areas for improvement, their needs and intentions, and, most vitally, their ability to form a synergy with the other teams. This is where takeaways from Game of Thrones will come into the picture. They can teach one a lesson or two about the struggles to achieve peace and harmony, and about how people can work to make it a reality.